Cotton fabric. 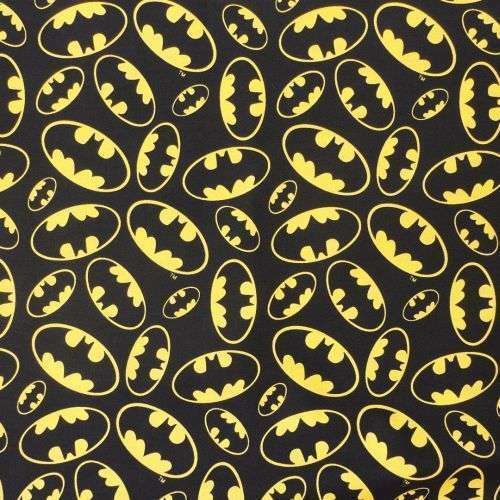 Gold Batman symbols in varying sizes tossed on a black background. *Do you use the Lock-it Pocket? *Do you use an ostomy belt? Break Free with Gus Gear! Gus Gear manufactures covers for medical devices like central lines, ostomy pouches, feeding tubes and other medical gear. We focus on patient safety and quality of life for those with medical challenges by allowing patients to their lives to the fullest. © 2019 Gus Gear LLC. All rights reserved. Join Gus Gear's Mailing List! Get special offers delivered right to your inbox!